Uptake rates for bowel cancer screening far too low - don't ignore the test! As part of the announcement of our new brand today, we are encouraging people to take advantage of the free bowel cancer screening test that has the potential to save lives. 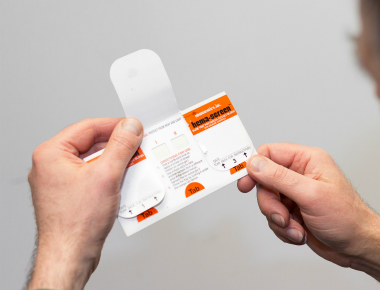 Bowel cancer screening can detect the disease at an early stage in people with no symptoms when it is easier to treat and there is a greater chance of survival. On average 59% of people living in Northern Ireland and England who are sent the bowel cancer screening test for free in the post actually complete it, but this drops to 56% in Scotland and 53% in Wales. If you’re registered with a GP and aged 60-74 (aged 50-74 in Scotland), you will receive a test in the post every two years. You carry out the simple test at home in private and it comes with step by step instructions. The test looks for hidden blood in your poo, which could be an early sign of bowel cancer. Almost 42,000 people are diagnosed with bowel cancer each year in the UK and more than 16,000 people die from the disease. It’s the nation’s second biggest cancer killer. However it shouldn’t be because it is treatable and curable especially if diagnosed early. Deborah Alsina MBE, Chief Executive for Bowel Cancer UK, says: “It’s quite simple, bowel cancer screening saves lives. I would encourage everyone who’s over 60 to take the test, and for those who are younger to encourage their loved ones over 60 to complete it. It could save yours or your loved ones life. To celebrate the new brand we’re giving away free wristbands. Get yours here. Follow us on Facebook, Twitter and Instagram, and share our new film featuring celebrities, supporters and healthcare professionals.